Generally tech presentation focus on how businesses can leverage the social media tools . The Digital Strategy presentation has evolved into a series of “consumable” Presentation. This first series reintroduces, new and emerging technology that is abailable to the cottage industry, from a strategy perspective. While it speaks to the creative, the information c will be helpful to any sector. 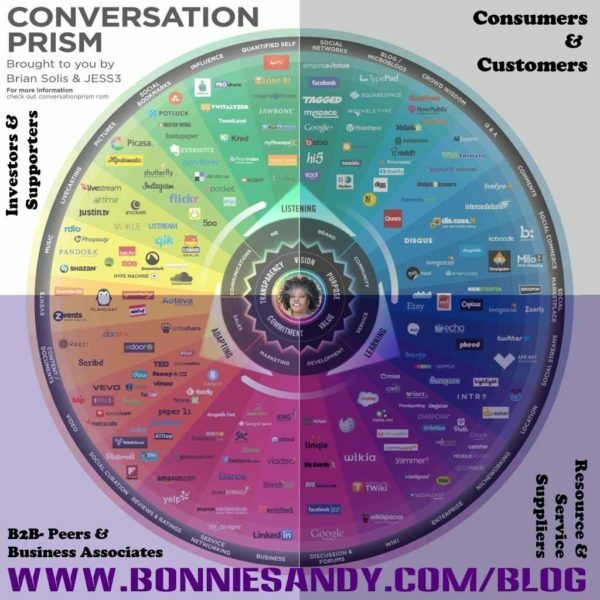 The accompanying diagram is an altered version of Brian Solis’ Conversation Prism. “Conversation” is broader than marketing and we looked at the tools in the communication needs of the artist and organization. This diagram is slightly altered from the original by Brian Solis’s to signify, the importance of your VIP (vested Interest parties) and Social media as tools of communicating with them. we communicate in all aspects of what we do… not just sales and marketing. These Digital seminars will be delivered via full day into seminars and full day workshops both offline and online. Sign up for our newsletter to be notified or contact me about presenting to your group. Posted in Service Menu and tagged conversation prism, digital strategy, technology.